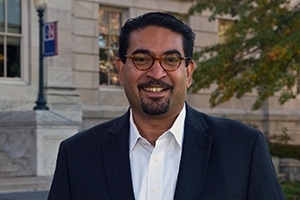 AU 2030: Colin Saldanha | American University Washington D.C.
CAS professor Colin Saldanha is chair of the Biology Department and a member of the Center for Behavioral Neuroscience. Through scientific inquiry, older ideas can be expanded, re-examined, or completely refuted. Biologist Colin Saldanha gets animated when discussing paradigm-shifting moments. He remembers when people thought of estradiol—a form of estrogen—as just a hormone for the female reproductive system. We now know that estradiol is not only present in males, but it’s a critical component of their brains. “It’s actually what makes the brain male in mammals. But it’s also important for a lot of other behaviors, including mood, learning, memory, balance, and the response to stress,” says Saldanha, an American University professor, chair of the Biology Department, and a member of the Center for Behavioral Neuroscience. Since scientists have ascertained that estradiol may protect—or fail to protect—capacities like learning and memory, this research could have implications for neurodegenerative diseases that afflict millions of people. Everything from Alzheimer’s to Parkinson’s to aging might be better understood. Saldanha cautions that the human applications of his research are yet to be determined. But as he and his colleagues amass this knowledge, they’re helping to decode the mysteries of the mammalian brain. As part of its AU 2030 initiative, the university has invested resources in the research area of neuroscience. “These synaptic connections are extraordinarily specific. They have to be. If you’re going to try to control a specific behavior, there has to be a very specific electrochemical circuit that conducts this information,” he says. His initial National Institutes of Health grant was to study this phenomenon in songbirds. Through several cycles of funding, Saldanha and his team examined estradiol’s core function. They learned that after a songbird’s brain injury, certain cells that normally do not synthesize estradiol do exactly that. And they do it within 24 hours of the trauma. Essentially, the songbird brain is treating itself in a way that the human brain cannot. For example, once a human being starts to show signs of having a stroke, it’s highly recommended that people rush that person to a hospital emergency room. That’s because the stroke has probably been occurring undetected for a while, Saldanha says. Yet that just doesn’t happen with the songbird. Its ability to synthesize estrogens rapidly after brain trauma completely eliminates that wave of degeneration. “These animals have evolved a rapid response to brain trauma that we’ve lost,” he says. If you’re just relying on what you cobbled together in high school biology, some of these findings might seem surprising. If humans are further along on the evolutionary chain, why are birds better at treating themselves? Well, mammalian aptitudes across species are not so clear cut. Saldanha’s research lab works with songbirds to learn more about people. The group is also now using rodents, since they’re closer to—and likely to provide a better template for—humans. He also touts observing “extreme biology” to find out how animals survive in extraordinary places. Saldanha points to bar-headed geese, which migrate over the Himalayas twice a year. Saldanha was born in Bombay, India. Suffering from a dislocated hip in 8th grade, he ended up in a body cast and suddenly had reading time. Someone gave him the James Herriot animal-focused novel All Things Bright and Beautiful, and he subsequently consumed everything Herriot ever wrote. With his interest in biology ignited, he eventually came to the U.S. for undergrad at Gustavus Adolphus College in Minnesota. He later earned an M.A., M.Phil., and Ph.D. from Columbia University in New York. During his post-doc years at UCLA, he and his wife were active participants and supporters of choral music. They still travel during vacation periods, but he doesn’t have much time for singing anymore. Yet even if he’s abandoned shower singing, he’s still left with boundless thoughts about science and nature. “Those moments happen, right? But they’re not ‘a ha’ moments. They’re mostly questions,” he says. Others scientists have pondered the woodpecker conundrum before, he says. But his question still provides a window into his curious mind, one that’s flourished at AU.